But the flip side is that we all get to experience lots of different toys and games. After a while, one might think that all the games may start to look the same but then you run into something very unique and immediately your eyes pop out and you just know you have to try it. Palette is one of those games. When I first saw this game, I was very intrigued. 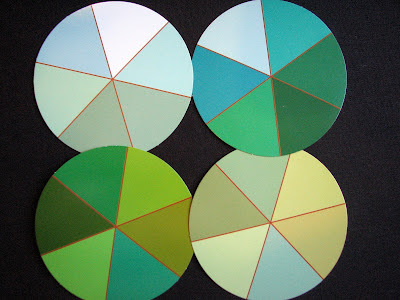 Test your memory with colors? How cool! I got it and then played it with my son and we loved it but then I started thinking about what skills are we working on here and I was stumped. Is this a working memory thing? Maybe you can play detective with me for a second. Skip the text for a minute and follow the next four pictures. Look at this color for five seconds. 1,2,3,4,5.. Now scroll down to the next photo. 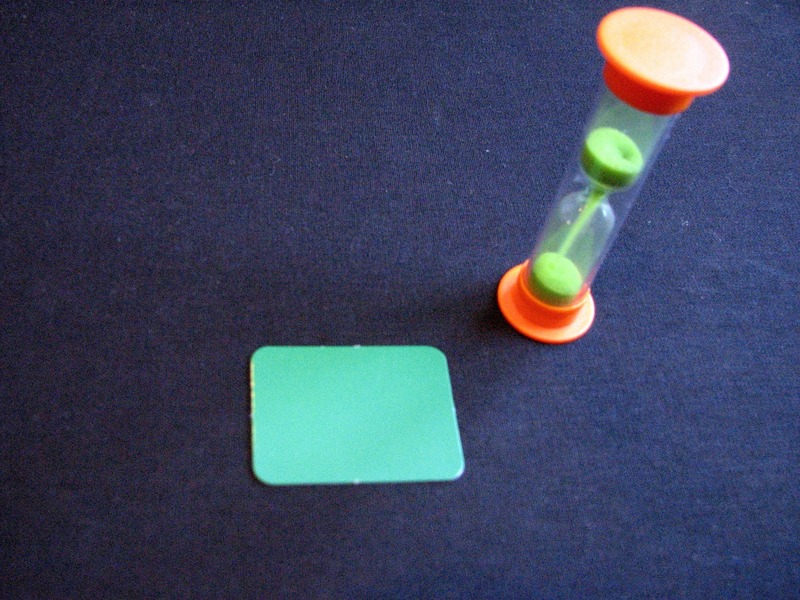 This game of 2 or more players requires you to look at a color chip for five seconds using a sand timer. 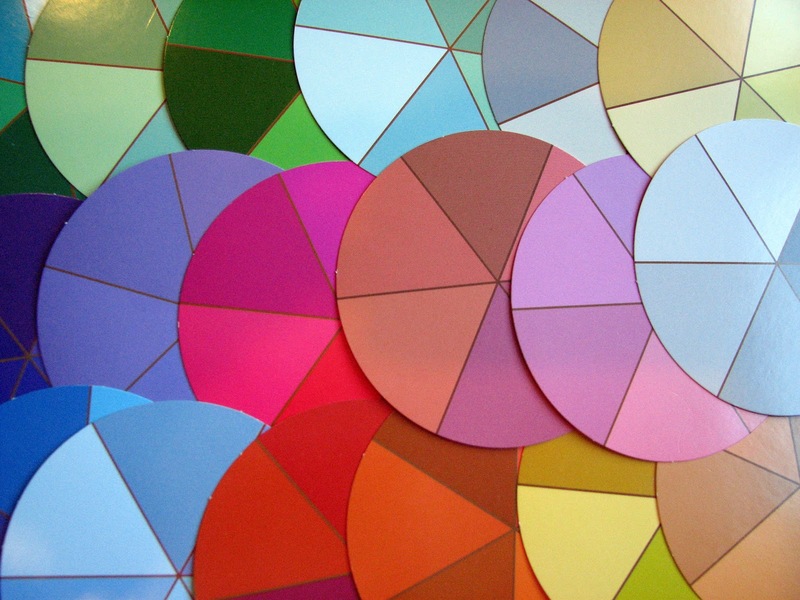 After your time is up, you show the color to the other players, put down the chip, and then attempt to identify the exact same color within a set of 18 color wheels, each wheel displaying 6 six colors (total=108!). Did you play the little game I just set up? Aren't you curious how you'd do with the actual game in your home? I was. I had to have it. I played it with each child separately and then we played as a family. That was crazy fun but I am not the only person that I know who had tons of fun with this game. "The three of us laughed so hard. We had SO much fun. It was a great family time," said Dr. Gayle Hermann, a child psychologist as she described her experience playing with her two children, 11 and 13. Gayle is a superhuman neuro-psychological testing machine, that is, she assesses a child's skills in various areas including cognitive, academic, memory, social/emotional, language, and executive functioning. Before beginning her private practice in Westchester, New York, she was working in New York City at the Marsha Winokur Learning Center at the Jewish Board of Family and Children's Services. It was a woeful day when this learning center closed its doors last year because there, for 14 years, Gayle performed hundreds of assessments on children, many, if not all of them were from families who could not afford such comprehensive testing because of the tremendous financial burden it poses (thousands of dollars). But today, I am lucky to have her to talk to me about Palette because she really is a master at figuring out a child's ability to learn and is always eager to help children do their best. So was this working memory? Gayle said it was not. "I see this as a short-term visual matching." Huh? What is that? Is that even necessary in this world? "Absolutely!" Gayle said. "There is a piece of what I would call visual discrimination. You're needing to not only match something but figure out how it's like or not like something else visually." She used the example of a child copying a letter from a workbook. A kid will copy the letter and hopefully he/she will have made it look like what was on the model. It's not so easy for every kid. Another example would be to look at people's faces and be able to see and remember the subtle differences on that face.... "Did she just smile at me?... or was that a smirk?..." "The world is not always black and white," Gayle explained that it is good to be able to see the big picture but really wanted to make clear her point. "But sometimes, we need to focus on the subtleties." "Often when memory games have no words, we innately put words to the pictures." said Gayle. "The first thing you do is look at the color and you name it." she said. Thus if we see a color, we will immediately say "green" but then we can go one step further and say "pine tree" or "grass green." Gayle and her two children (11 and 13) naturally said such words to themselves to hold onto the image of the color they saw but she said that younger children might not know to do that. She suggested that we could teach them and other strategies to help them remember. How about now? Can you find your color? But are we then giving them some sort of secret? Shouldn't this be something they get on their own? Gayle said that we have to teach them the secrets. "Learning doesn't always have to be so hard if you learn some of the secrets of different strategies to help yourself," she explained. "So using things like labeling the color or identifying it with something that makes you think of [that color] are all ways to help you hold onto what you see. Not everybody can take a visual snapshot like Cam Jansen where 'click' she would take an image in her head and she would hold onto it. Not everybody can do that." Who Are You Really Challenging Here? Gayle saw many possibilities with this game as a way for children and adults of varying abilities to be able to play together while trying to reach what I like to call "beat your personal-best goal." This game seems to be well-designed to enable this type of play where you are trying to beat your own personal-best score. There is no communal board to look at so that you can measure how you are doing against your opponents. 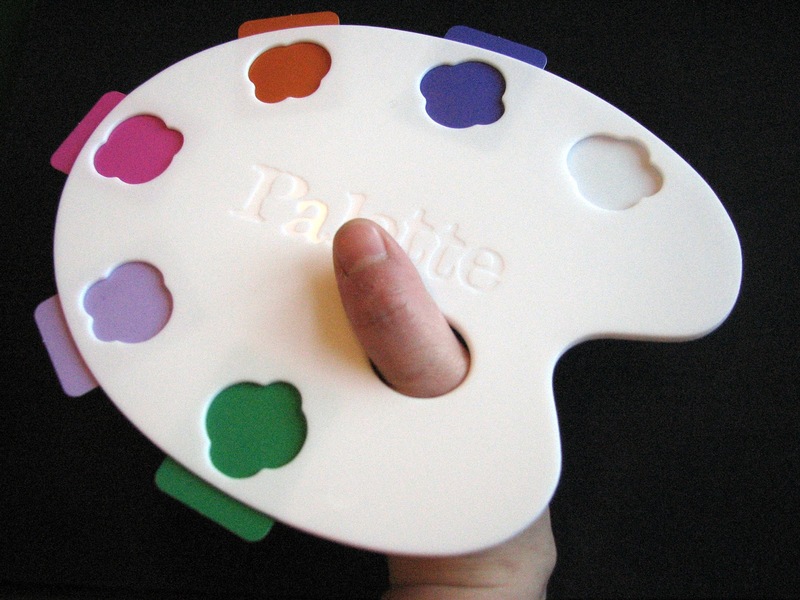 Your palette will be sitting in front of you or you will be holding it. You will naturally continue to look at your own palette and focus on your own gains. "That's what I felt as well," Gayle said. "I found it more about personal achievement." It was this one. How'd you do? You can go back to the text now. There is a lot more to say, I promise! "Fair is Not Always Equal"
Gayle's work has not just been about assessing children's abilities. Rather, it's about gathering information about them to best help them achieve their goals. When she plays this game, she naturally thinks about how everyone can come together to learn together. One suggestion she had for the little ones (under 6) could be to offer just half of the color wheels and half of the corresponding chips to play. "In the same way that you might start a task for a child on a smaller scale and then build up," she said. "Even when you play "Concentration," either with a deck of cards or picture cards, you start with a small number of cards, and then you build up, adding more once a child's memory builds up." I was so happy to hear that because I really wanted to play this with my younger son who is just five years old (suggested age on box says 6+) thus Dr. Hermann's suggestion was good news to me. "You can also do that for a child who is older than six but whose visual memory skills are not strong." This is your game board. This is where your eyes will go. It's like you're playing a one-player game in a multi-player setting, much like a marathon. 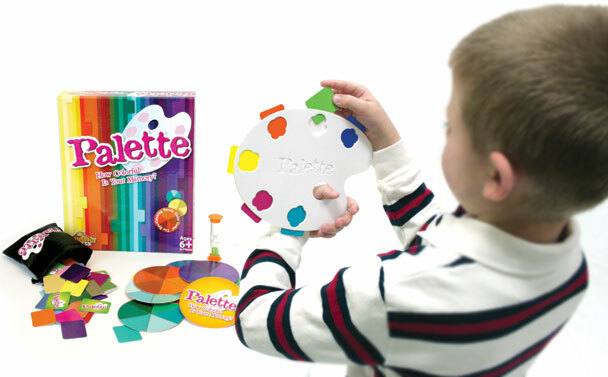 Palette is a great way to promote the concept of "personal best." Gayle also suggested other adaptations including turning the timer over twice to give a child more "looking time." I was surprised to hear that. Won't someone feel inadequate that he needed to have more time to look at his color chip? Won't other players cry injustice? "I think that I'm of the philosophy that fair is not always equal and that describing that everybody has things that are easier for them and are harder for them," Gayle advised that parents could be very positive about this concept of fair play. "In order to make the game fun, this is how we are going to make adjustments." My family tries to play games together but we don't always make it. This time I really called everyone to the table to see just how well I could apply Gayle's advice in our own home. It was a bit before bedtime and so I thought we could play a quick game and the winner would be the person who was the first to fill his palette with just three chips. At the very beginning, I asked everyone how many seconds "looking time" they wanted. (My kids had played with me individually so they had a general idea of how much time they needed). My little one was very happy to get a whole 30 seconds. Number 1 Son wanted 15 seconds. I wanted just 5 seconds and my husband wanted 10 seconds. My husband had never played before and all of us forgot he was a little color blind. Note: Even if you are a little color blind, you will not be able to hide it here. The truth will come out but you will laugh about it. We did. As we played, our adjustments were adjusted once again- happily. Number 1 Son went from 15 seconds of looking time to 5 seconds of looking time. Number 2 Son stayed with his 30 seconds and my husband refused to get a complimentary chip added to his palette but I am proud to say, he added an extra 20 seconds to his looking time. I was really happy that he could show my kids that he could have fun even if he adjusted his looking time to match that of my 5-year-old. In the end, we didn't just play a quick game to see who'd get three chips first. We couldn't help it. We finished until someone's palette was filled! That actually was mine. I WON!!!! Coincidence??? Maybe not... but I don't think my kids knew that. Well, maybe they didn't say anything because they got to go to bed a little later... I pretended not to notice. I was too happy for my win and our win as a family. *This is one of the reasons that I will be introducing two girl testers to Toys are Tools soon. The other reason is that there are just some toys that boys will likely not like but that doesn't mean we shouldn't talk about them here. Disclosure statement: Toys are Tools has not been compensated in any fashion by the manufacturer or retailer of any of the mentioned products for the publication of this post. The product was given to Toys are Tools and to Dr. Hermann to facilitate a review. Reviews are never promised. This looks like so much fun!! I hope to get one! Wow! 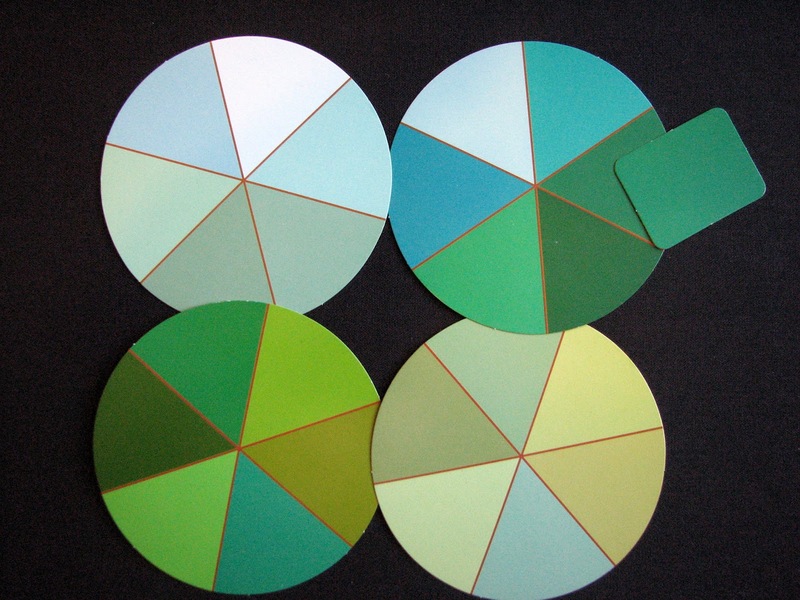 This ties in to Montessori color matching tiles. I LOVE it!!!! I also like that it is not language or math skills dependent, but can promote skills in both areas. I like the Musical Hand Bells that fat Brain sells, which are a toy, a learning tool and an instrument all in one depending on how you look at it. I also think the rainbow looks very cool - part puzzle, part toy, part instrument - yet very pricey. I can't go to the paint store without the paint chip in my hand! I too had a hard time (and I also have a design degree) but it was lots of fun! I can see how this could be very addicting! Picture test was great! I was one slot off on the correct wheel. But much lighter color! This game will drive my husband mad, as he's color blind!! What an awesome sounding game, so different and unique. this would be a great addition to an art class too! Wow, this looks really neat! It uses very different skills than most games. I've never seen anything like it. This looks like a lot of fun. We would love to try it out! This looks like an awesome game that will be great in our programs at Sharp As A Tack. I can't wait to try it! this looks like a great game to help kids slow down and pay attention. I think it would be a great tool for my kids with ADHD as well as for my daycare kids.